We review four decades of research about the corporate governance of multinational corporations (MNCs), which we label International Corporate Governance (ICG). We identify and discuss three main streams of research that draw on different conceptualizations and theoretical lenses of (corporate) governance. After synthesizing their respective findings, we propose several avenues for future research that integrate these three streams of research with the goal of developing a more nuanced understanding of ICG. We hope this review article will inspire international business scholars to continue examining how corporate governance can be an effective tool for MNC success. Dans cet article, nous passons en revue quatre décennies de recherche sur la gouvernance d’entreprise des firmes multinationales (FMN), que nous appelons Gouvernance internationale des sociétés (GIS). Nous identifions et discutons trois grands courants de recherche qui s’appuient sur différents angles conceptuels et théoriques de la gouvernance (d’entreprise). Après avoir résumé leurs résultats respectifs, nous proposons plusieurs pistes futures de recherche qui intègrent ces trois axes de recherche dans le but de développer une compréhension plus nuancée de la GIS. Nous espérons que cet article de synthèse inspirera les spécialistes de l’international business pour continuer à examiner comment la gouvernance d’entreprise peut être un outil efficace pour le succès des FMN. En este artículo, revisamos cuatro décadas de investigación sobre el gobierno corporativo de una empresa multinacional (EMN), que etiquetamos como Gobierno Corporativo Internacional (GCI). Identificamos y discutimos tres corrientes de investigación que se basan en diferentes conceptualizaciones y lentes teóricos de gobierno (corporativo). Después de sintetizar sus hallazgos respectivos, proponemos diferentes avenidas para la investigación futura que integra estas tres corrientes de investigación con el objetivo de desarrollar una comprensión más matizada del GCI. Esperamos que este artículo de revisión inspire a los académicos de negocios internacionales a continuar examinando como el gobierno corporativo puede ser una herramienta efectiva para el éxito de las EMN. Neste artigo, revisamos quatro décadas de pesquisas sobre a governança corporativa de corporações multinacionais (MNCs), as quais denominamos Governança Corporativa Internacional (ICG). Identificamos e discutimos três principais correntes de pesquisa que se baseiam em diferentes conceituações e lentes teóricas da governança (corporativa). Depois de sintetizar suas respectivas conclusões, propomos vários caminhos para futuras pesquisas que integram essas três correntes de pesquisa com o objetivo de desenvolver uma compreensão mais sutil da ICG. Esperamos que este artigo de revisão inspire acadêmicos de negócios internacionais a continuar examinando como a governança corporativa pode ser uma ferramenta eficaz para o sucesso das MNCs. The authors gratefully acknowledge comments and suggestions from Professor Benito (Editor) and three fantastic anonymous referees, conference participants at the Academy of Management’s 2018 Annual Meeting in Chicago, the International Corporate Governance Society’s 2018 Annual Meeting in Shanghai, and the 2018 Strategic Management Society’s Special Conference in Oslo. All errors remain ours. Accepted by Gabriel Benito, Consulting Editor, 2 March 2019. This article has been with the authors for three revisions. Summary of the Reviewed International Corporate Governance Articles (in alphabetical order). This article examines the effects of national corporate governance systems on MNC practices and how globalization has affected the nature of national business and employment systems. This chapter theorizes about the nature of governance costs within MNCs’ HQ–subsidiary relationships. 62,066 firm–year observations from 80 countries. Family ownership structures affect foreign market entry mode decisions and the presence of a non-family manager moderates the relationship between family ownership and entry mode decisions. 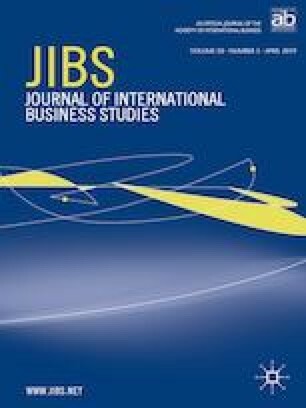 This article assesses the extent to which the results of Bartlett and Ghoshal’s (1989) work can be incorporated into what has become one of the core explanations of multinational strategic management, i.e., the transaction cost-based theory of international production. Results indicate an inverted U-shaped relationship between managers’ technological competence and international diversification, and a positive relationship between contingent pay and international diversification. Both contingent and non-contingent pay moderate the relationship between technological competence and international diversification. Privately-owned firms (both foreign and local) are in a better position than state-owned firms for deploying aggressive actions to grow their business. Also, firms with multiple owners are less able to implement actions that drive business growth. We use acronyms for some of the most common theoretical lenses. Specifically: AT Agency Theory; CC Comparative Capitalism; CCG Comparative Corporate Governance; I-R framework Integration–Responsiveness Framework; IT Institutional Theory; NBS National Business Systems; OLI Framework Ownership, Location and Internalization Framework; RDT Resource Dependence Theory; VOC Varieties of Capitalism; UET Upper Echelons Theory. Equilar. 2017. Corporate governance outlook 2018. December 2017. Available at: https://www.hoganlovells.com/~/media/hogan-lovells/pdf/select-2017/equilar-corporate_governance_outlook_dec_2017.pdf. Accessed 20 Dec 2018. Tihanyi, L., Aguilera, R. V., Heugens, P., van Essen, M., Sauerwald, S., Duran, P., Turturea, R. (in press. State ownership and political connections. Journal of Management. https://doi.org/10.1177/0149206318822113.